Genealogy of our families who descended from German, Dutch, French, English, Irish and Scottish immigrants. 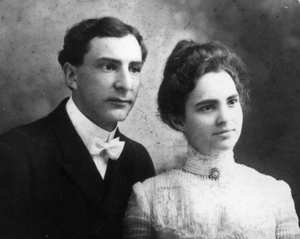 Mary Elizabeth Moyer and Henry Royer Kreider were married in June 1902. 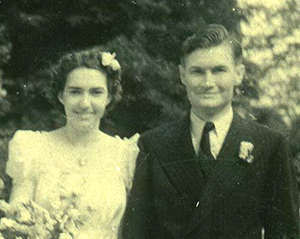 Ruth Moyer Kreider and William Albert Hiltner were married in August 1939 in Toledo, Ohio. 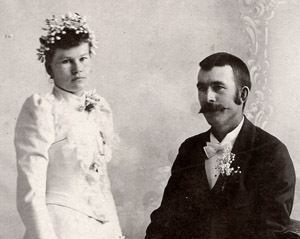 Anna Mary Riemann and Fred Chris Wunnenberg were married in March 1891 in Des Moines County, Iowa. 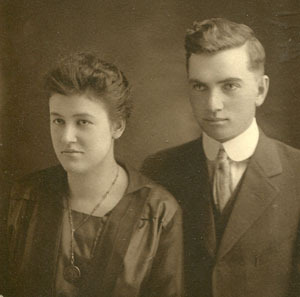 Minnie Clara Wunnenberg and Chester Alan McKeown were married in January 1920. 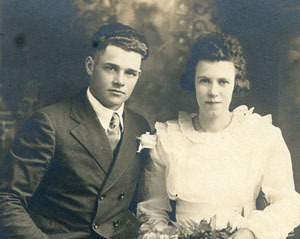 Eva Robinson and Ralph Hedges married 1916 in Illinois. Learn more about each family by clicking their photos. Our family history research is based on love of family that has been handed down through the generations. We started with a few family stories that gave hints and clues to dates and places. Visits to cemeteries gave us names, dates, and sometimes relationships to work into the family tree. Hiltner.com will always be a work in progress as our research continues. Photographs and stories have come from family members and we will be adding more as we find them. Please feel free to contact us if you have family information or photos that you would like to share. Contact forms are located in each family site. For more information about the following people (and more) see the Mary Elizabeth Moyer and Henry Royer Kreider site. John Philip Achenbach, Rebecca Achenbach, Elizabeth Bodine, George Bowman, Leah Bowman, Nathaniel Brittain, Henry Collins, Matthias Cramer, Sytie Dirks, Joseph Dorset, Eva Anna Engle, Anna Marie Boyer Engler, John Fehr, Elizabeth Garritzen, Eva Geist, Hans Jacob Geist, Mary Gross , Anna Barbara Hoffman, Johann Jacob Hoffman, Hermanus Kline, Hiram Roe Kline, Mary Klose, Jacob Kreider, Philip Kreider, Anna Maria Marion, Andrew Morr, Joseph Klose Moyer, Maria Margaretha Mayo, Christopher Meyer, Elizabeth Poling, Susanna Ream, Catharina Elizabeth Renninger, Catherine Royer, Georg Christopher Royer, Henry Royer, Sebastian Royer, Alexander Schaeffer, Benedictus Schilling, Lewis Henry Schuy, Catherine Smith, Ann Stillwell, Nicholas Stillwell, Eva Catherine Strouse, Ann Tealby, Thomas Janse Van Dyke, Edward Willet. Ancestors of John Nicholas Hiltner can be found at the Ruth Moyer Kreider and William Albert Hiltner site, along with Margaret Duffy, Margaret Frisch, Elizabeth Hempleman, George Hempleman, Henry Morris, Mary Morris, George Weaver, Margaret Weaver, and Ida Levina Schafer. Learn more about Dorothea Marie Bremer, Emelie Rehfeldt, Johanne Margarethe Christinian Reineke, Fredrick William Rieman, and Johann Heinrich Albrecht Wunnenberg at the Anna Mary Rieman and Fred Chris Wunnenberg site. Some ancestors of Chester Alan McKeown can be found at his site, including Mary Arthur, John Glasgow, Rosanna Glasgow, Sarah Hooks, Margarett McBride, Margaret McCollum, Alexander McKeown, Moses Parker, and Isaac Shields. For ancestors and extended family of Ralph Hedges, including Fielding C. Allen, Sarah Lavina Allen, Mary “Polly” Ann Armstrong, Peter Thompson Cassity, William Ribelin Hedges, Levi Hedges, Matilda Hunt, Mary Ann Kiher, Ann Price, and Rosannah Ribelin see Ralph and Eva Hedges’s site.